No. 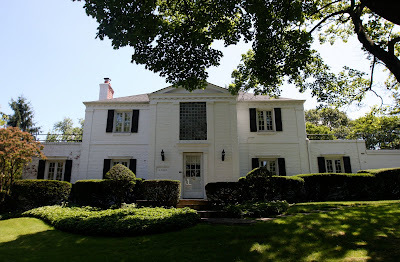 10 Pickwick Road in the South Strathmore development by Levitt & Sons, built in 1937 in Manhasset. The Levitt's used No. 10 as a model home and to promote their development they had this house wrapped in "cellophane zipped up the center, and tied with a big red bow. On April 23, 1937, Miss Mitzi Green star of Babes in Arms undid the zipper and by day's end some 5800 people had trooped through the new house" (Manhasset: The First 300 Years). Click HERE to see No. 10 Pickwick Road on google earth. a far cry from some of the levitt's postwar efforts. while some were "houses of the future", i was talking to a friend who had lived in one that had paperboard sheathing. he said it was great - when he locked himself out, he just tore the side of the house off and let himself in and nailed it back on. this was my pediatrician's house when i was a little boy in the mid sixties. it was the home of michael and barbara gilbert. the doctors office had a separate entrance on the side of the house. had my first injection in that house, so it doesn't bring back the greatest of memories, but i'm so glad you posted it. i can still see it driving up northern boulevard. thanks!